... and to this ultimately charming, local accommodation called “Alter Winzerkeller” (Old Wine Cellar). Talking to my host Ernst Vogel, and taking a peek round the building tell me that he hasn’t been sitting still, ultimately: “My son is an architect, and I do most of the building work”, Ernst Vogel adds laughing while showing me around even the design of the “Old Wine Cellar” itself is all handmade by himself. ... I keep asking Ernst Vogel, honestly impressed. “My father and grandfather were barrel makers around here, you know”, he smiles modestly, adding: “I take after them in enjoying to build things with my own hands. The ‘Old Winer Cellar’ would have been sold elsewhere if we had not, with the support of the Office for Antiquities and Monuments, preserved and modernised it into the beautiful, historic building it is today.” Even the furniture in the brand new lounge has “only” been covered by the furniture company; the construction of the chaises and sofas comes from the (technically) expert father-son-duo. Fantastic. Plus, there’s even a room for the creative souls, like myself in here: “Yes, I’m always doing watercolour painting classes. The art in the guest rooms is also mine”, Ernst Vogel continues to smile modestly. No wonder most of his guests are regulars – it’s easy to fall in love with such an accommodation. Love this brand new lounge right next to the old building including a “creative room” for activities such as watercolour painting courses all the way to the “Old Wine Cellar” itself, now turned breakfast and reception rooms. 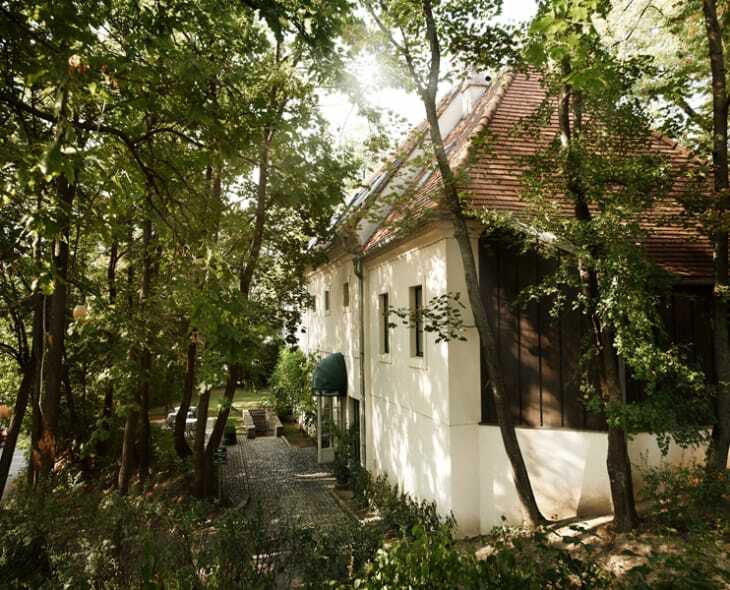 Definitely add “Alter Winzerkeller” to your list of accommodation in Lower Austria, close to Vienna!